High-Density Power Distribution The Switched CDU’s combine remote configuration and management with power distribution and power and environmental monitoring. Reboot a single or dual-power server with one command. Receive SNMP-based alerts and email alerts when power or environmental conditions exceed thresholds. Assign users specific access rights to designated outlets or groups. Only the Switched CDU products provide the flexibility needed for all data centers and remote sites, including power requirements for high-amp, high voltage; UL 60950-1 branch circuit protection; SSL & SSH security; and SNMP-based input current monitoring. Remote Power Management: Power cycle individual power outlets, or groups of power outlets, to remotely reboot servers and network devices, anywhere in the world. Or, power-off unused power receptacles. High Power Distribution: 208V or 230V power; 16, 20, 30 or 32-Amp power input feed options > High Density: Single power input feed; 24 outlets per enclosure. IP Access & Security: Web interface, SSL, SSH, Telnet, SNMP, FTP, SNTP, Syslog, LDAP, LDAPS, TACACS and RS-232 access > Add an Expansion Module: Daisy chain the Switched CDU Expansion Module (CW/CX) for power management of separate power circuits from a single IP address. Environmental Monitoring: Each Switched CDU supports two temperature & humidity probes and reports conditions thru the Web interface. SNMP Traps: Provide automated alerts for power and environmental conditions. Input Current Monitor: Precisely measure the aggregate current draw (in amps) on each power circuit. On-site verification of the input current with the LED digital display. Remote verification via browser or serial screen. Power-up Sequencing: Prevent an in-rush power overload. Easy to use and access, secure, integral HTML Web GUI over HTTP/S, plus LDAP/S and TACACS+ external authentication and authorization support Secu.. The Sentry CW-16HF2/E Fail-SafeTM provides fail-over redundancy to single or dual-power supply servers and network devices. Exclusive to the..
Increasing power demands and density in the equipment cabinet requires new functionality from your cabinet PDU. 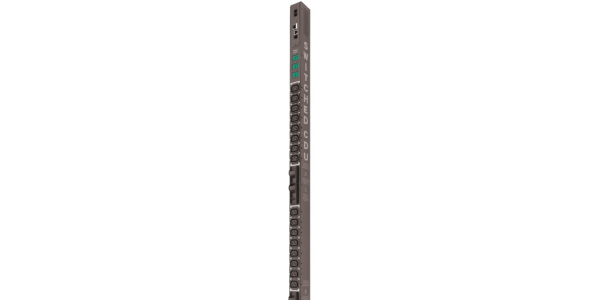 The Sentry Cabinet PDU product family ..